They described actress Marie Wayne as a “creepy, sinuous, sneaky, and dangerous sort of villainess.” The actress was determined to be a vamp like none other. Sadly, she disappeared from Hollywood as quickly as she arrived. Her story has never been told. Her whereabouts were unknown — until now. When Marie Wayne came to Hollywood, she concocted some tale about having been born of American parents in Tokyo, Japan, where her father was a diplomat. In reality, Clarence W. Derby worked in his father’s grocery store in Saginaw, Michigan. Somewhere in the mid-1880s, Clarence married Carrie Estelle Ennis, a teenager from Illinois. On December 11, 1887, the stork delivered their bundle of joy. The birth of little Marie Estelle made the local newspaper. “Clarence W. Derby is jubilant over the debut of ‘Miss Derby,’ which young lady, weighing eleven pounds, sixteen ounces to the pound, appeared for the first time at his house on Monday morning,” the Saginaw News reported. After the stork dropped off all “eleven pounds, sixteen ounces” of baby Marie, the bird stayed around to rest for a few days. Carrie, too, stayed off her swollen feet! She was pooped. Someone around town had it in for Clarence. By 1888, he’d taken over his father’s grocery store. Over the course of two weeks, an arsonist tried in vain to burn Clarence’s business to the ground. While authorities might have had doubts about the first blaze, the second incident left no doubt that someone was up to no good. In the torched building, they found bundles of “excelsior, soaked in turpentine,” scattered around the business. The Derby marriage eventually went on the skids. By the start of the new century, Marie and her mother were living with Carrie’s parents. Then, in 1908, Carrie, now going by Stella, married stockbroker Herbert N. Wayne. The Wayne family, which included Stella’s mother, Mary Ennis, settled in The Bronx. The scene was set for Marie to find her way into show business. She also found herself a man. Ben Deely, a comic vaudevillian. They were married. She became wife number four and part of his act, The New Bell Boy. Ben Deely’s Company, assisted by Marie Wayne. The critics raved. “Deely and Wayne prove up as being in the top most class when it comes to delivering the goods over the footlights. Miss Wayne is irresistible,” noted a Fort Worth, Texas, critic. 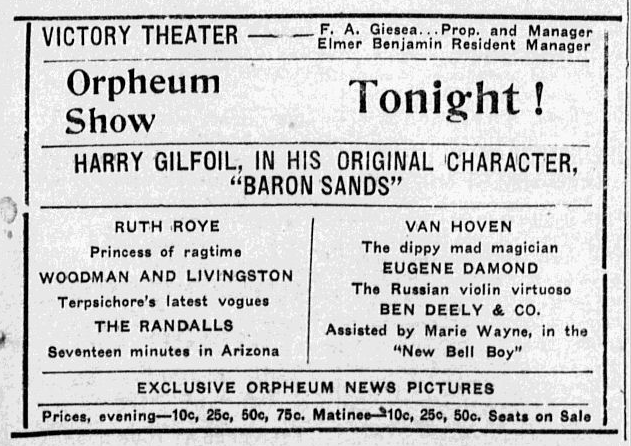 In 1914, the Deelys were lured to Hollywood to make films. Marie appeared as “JinJur, a Maid in the Emerald City,” in The Patchwork Girl of Oz (1914). The film is perhaps the only chance we’ll have to see Marie Wayne’s work on celluloid. The Deelys signed with Balboa Films and settled in Long Beach. The studio featured Ben and Marie in a one-reel serial, Ima Simp, Detective. The critics loved Marie. 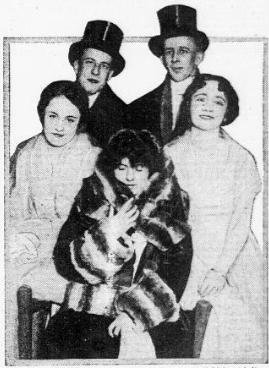 Balboa leading ladies (l-r) Marie Wayne, Lois Meredith, and Bliss Milford are pictured with George Seitz (scenario editor) and George A. Smith (serial director). By the time the couple came to Balboa, their marriage was in trouble. Marie had notified the authorities of her husband’s violent streak. Then, in October 1914, all hell broke loose. A combination of booze and temper sparked a night of domestic violence. In a fit of rage, Deely punched friend E.W. Maxwell in the face, breaking his nose. He then turned his fury on Marie. Their knock-down-drag-out sent Marie to the hospital with a face cut and a right eye that was swollen shut. The Deelys were finished. Marie went out on her own. Marie transformed herself into a villainess for the screen. 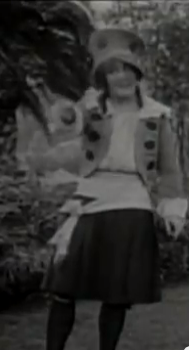 Pathé cast Marie as the vixen in a Pearl White serial, Pearl of the Army. The screen’s new vamp told The Photo-Play Journal how she transformed herself from comedienne to siren. She studied pussycats. She modeled herself after her feline friends. 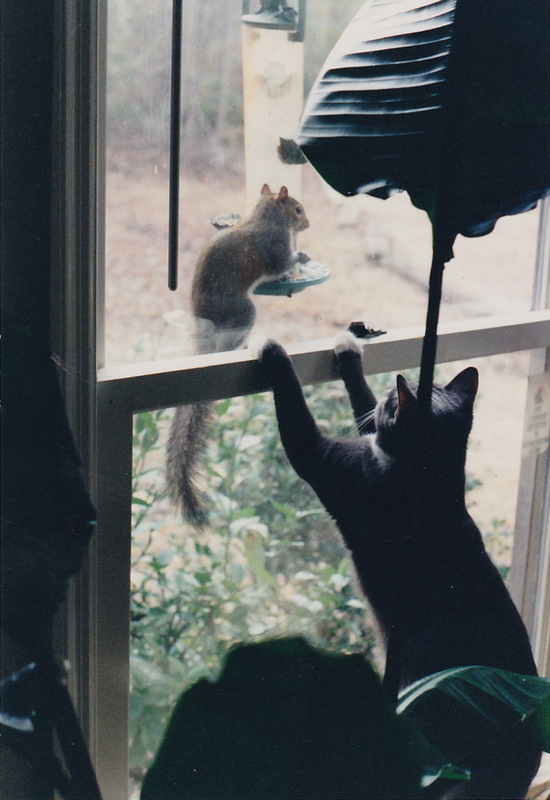 It is here that I jump to the defense of my feline friends. Indeed, some of the best friends I have ever had have been my kitty pals: Flossie, Pee-Pee, Do-Do, Stella, Peetie, Aggie, Shugie, Ollie. The list goes on and on. Stella goes after a squirrel trying to steal bird food. In fact, as I write this, a tinge of sadness has overtaken my concentration. 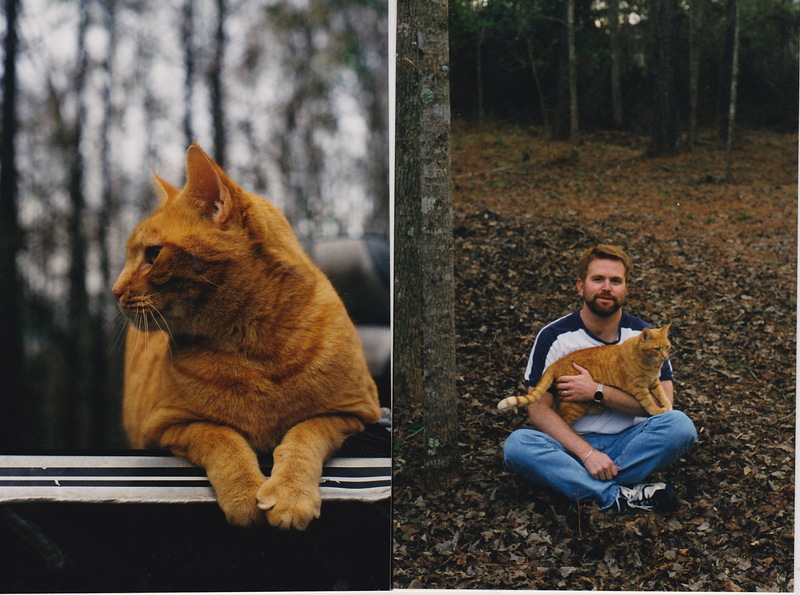 These feline friends are now in kitty heaven. I realize how much I miss them. Damn! Why did I have to go searching for these photos? Back to Marie. 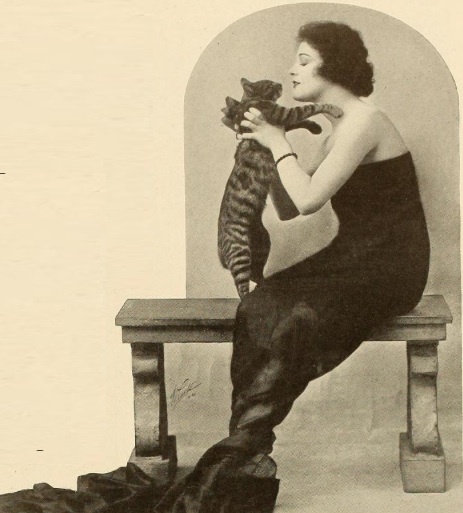 Her aversion to cats was most certainly for the sake of publicity. As it turns out, the publicity did her little good. 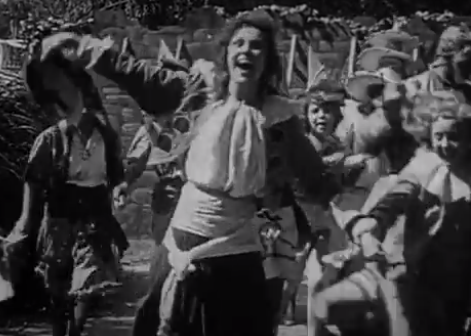 After a leading role in A Song of Sixpence (1917), Marie Wayne disappeared from the screen. She didn’t go back to Ben Deely. He took up with and married Barbara La Marr. In 1920, Marie was living on 51st Street in Manhattan. She was calling herself an actress in pictures. By 1930, she was living with her mother, stepfather, and maternal grandmother in Santa Monica. She remained with her family until her death on May 24, 1949. Her death certificate suggests that Marie spent the last decades of her life in ill health. She suffered from rheumatic fever and scoliosis. In the last years of her life, she developed heart disease. Two pieces of information on the document are of particular interest. Marie’s informant, her mother, said her daughter had never married. She also gave Marie’s year of birth as 1894. 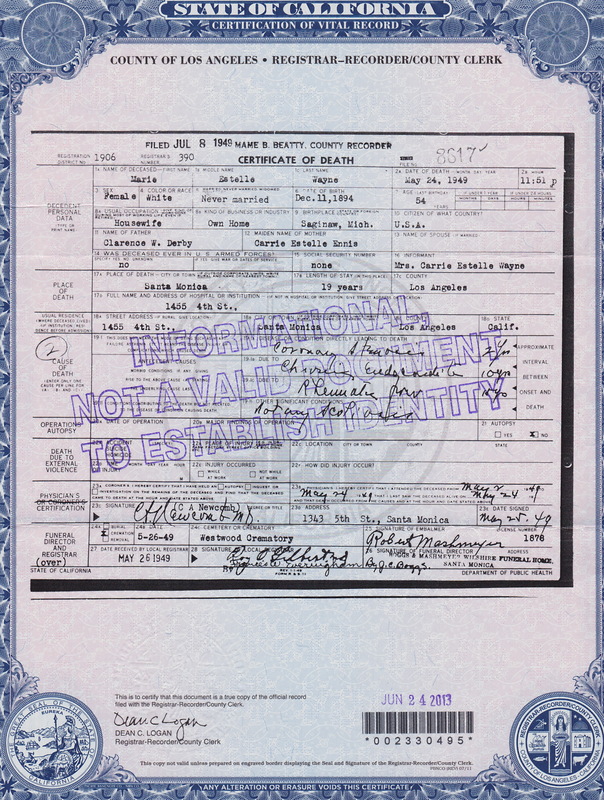 The 1900 U.S. Federal Census clearly shows Marie E. Derby as being born in 1887. Not a big surprise. Most actresses took an average of five years off their ages. Perhaps Marie Wayne was more like felines than she thought. Maybe she was striving for those extra nine lives.